If you can remember the good old days when a bride and groom would hire a professional photographer to handle the entire wedding picture taking responsibility, then you were probably around long before technology made it possible to take pictures with something other than a camera. Today, anyone with a smartphone can lay claim to being an amateur photographer. Because of the presence of social media and new photography technology, brides and grooms have to consider what kinds of limitations they want to put on picture taking during the wedding event. There should always be a professional photographer left in the mix to assure there will be a least one quality set of pictures for an album. Beyond that, who else the wedding party wants taking pictures of things like a bridesmaid dress is open for discussion. In most cases, there’s a good chance the bride has been “planning” her wedding since she was a little girl. If she wants a picture of the gold bridesmaid dress, it’s well within her rights to decide who is going to take those pictures. If she doesn’t want any pictures of a bridesmaid dress, that should be okay as well. It’s really the bride and groom who should dictate who is going to be permitted to shoot and post pictures of that gold bridesmaid dress on behalf of the wedding party. To help deal with the issue of pictures, here are three options the bride and groom might want to consider. Option #1 – All Hands on Deck – With this option, it would be incumbent on the bride and groom to inform guests picture taking and sharing by anyone is more than welcome. There’s a good chance it will create a hectic atmosphere and could interfere a bit with the event, but most guests will use common sense and refrain from taking pictures until it’s appropriate. 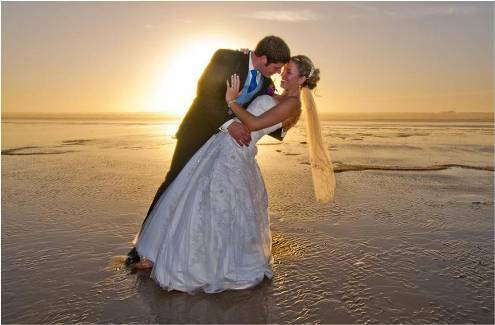 For the bride and groom, the real benefit will be having an abundance of wedding pictures commemorating the event. It should be stated to all guests that there is a professional photographer on site, who should always be given priority. Option #2 – Limitations – By letting the guests know ahead of time there will be plenty of opportunities to take pictures at the wedding party’s discretion, they will be more likely to follow the prescribed schedule. The opportunity to take staged pictures should be enough to squelch the picture-taking desire of most guests. Additionally, the wedding couple could encourage guests to share their pictures through a common #hashtag, thus creating the ability to control the content being placed on social media. Option #3 – No Pictures – In a highly structured wedding where things need to stay on schedule, prohibiting pictures is the only way to truly control guests. It would require that everyone be forewarned ahead of time via the invitation and perhaps posted signs at the event. There’s also a chance it will offend some guests. However, an intimate wedding with peace of mind makes it worth the risk, and most guests will understand and cooperate. Above all, the day belongs you two, the bride and groom. It’s your responsibility to decide ahead of time how you want to have your nuptials recorded for prosperity. It’s up to the guests to go with the flow and help make the event memorable. For more tips about photographs at wedding have a look at Azazie.